Debido al gran numero de visitantes de habla inglesa, pensamos que es oportuno resumir brevemente en inglés el propósito de este sitio. / Due to the increasing number of English-speaking visitors, we thought it was appropriate to post a short summary of what this site is about. The overall mission of El Cuadro de desHonor (The disHonor Roll in English) is to document and expose academic fraud in Mexico. Our current focus is exposing degrees holders from diploma mills abroad, a phenomenon that has taken epidemic proportions in some universities and research centers around the country. From Argentina to Zimbabwe, fake degrees are both present and problematic, but this problem has come into the limelight in Mexico in the past couple of years as government authorities seek to improve educational standards nationwide. Diminishing quality has caused a brain drain to the United States (and elsewhere) as students seek degrees from what they perceive to be more prestigious institutions. But going abroad is not always a possibility for many. It is worth highlighting the fact that many of these fake degree holders work in public universities and a majority receive federal grants through the National Researchers System, fleecing the already overburdened taxpayer. 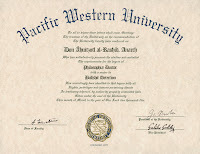 In only a couple of weeks, we have already discovered dozens of fake degrees holders, and will be posting them progressively. We also post a summary our "candidates" to The disHonor Roll every few weeks, so even if you don't live in Mexico, visit to find out which academics in your field are fakers. Spread the word and please don't hesitate to comment! Publicadas por El Āhuitzotl a la/s 9:17 a. m.